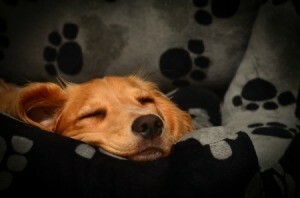 Dogs can make a variety of noises while they are sleeping. Unless there are indications of pain or trouble breathing, they are typically normal sleep behavior. This is a guide about dog making noises while sleeping. My two year old CoJack girl sleeps next to me. When she is asleep she grunts like she is talking. Is that a usual trait? YES. Our lab even "runs" in his sleep. He usually sleeps on his side, but all 4 legs are going 90 miles an hour. Often he will also bark or growl in his sleep. Our shepherd also does, but not as much as the lab. This sounds like common dream behavior, though if you're worried about her air passage or sleep apnea (especially if she's one of the pug-nose kind of dogs) then you can take her to a vet.